You are here: Home / All Posts / Special Effects Mayhem with The Shoggoth Assembly! Special Effects Mayhem with The Shoggoth Assembly! Skinned Horror Face Mask - Krystal - Art by The Shoggoth Assembly. All rights reserved. This item on sale at The Shoggoth Assembly Etsy store! Steven King isn’t the only creepy thing in Maine. 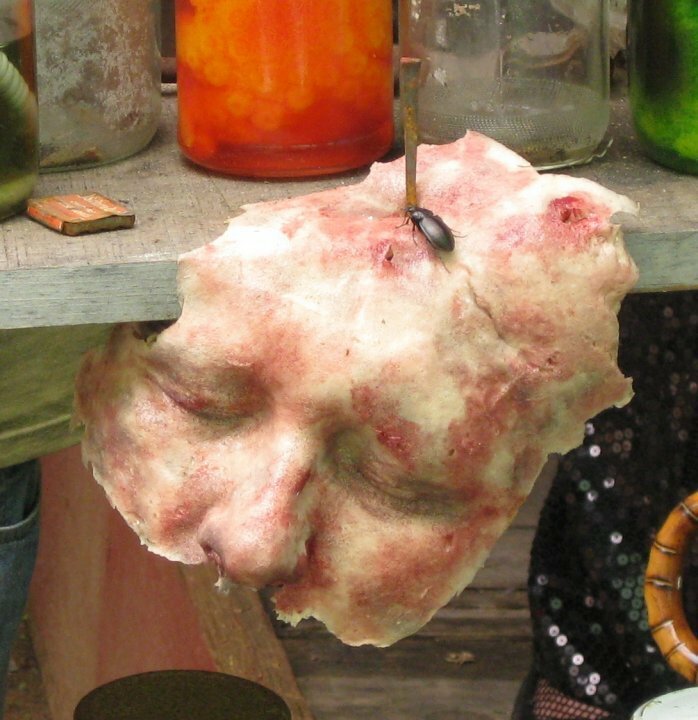 Artist co-op The Shoggoth Assembly creates awesome, old school special effects makeup, Lifecasting (Silicone & Alginate), prosthetic effects, prop creation, backgrounds, storyboards and artistic design (and many other services) for the film, stage and photography. The backbone of this creative group, is special effects wizard Eric Anderson, who seems to be able to make just about anything. Here are a few more fantastic examples. 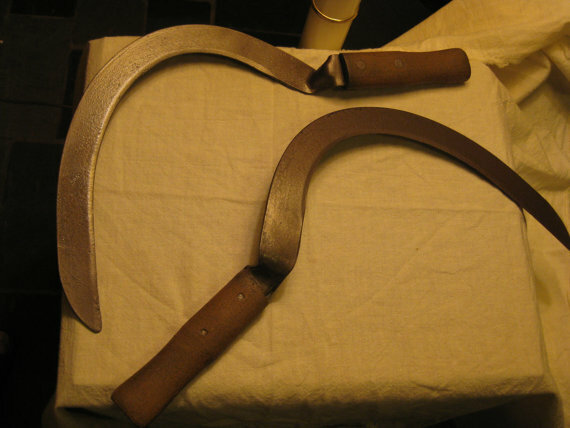 Prop Plastic Safety Sickle. Art by The Shoggoth Assembly. All rights reserved. This item on sale at The Shoggoth Assembly Etsy store! 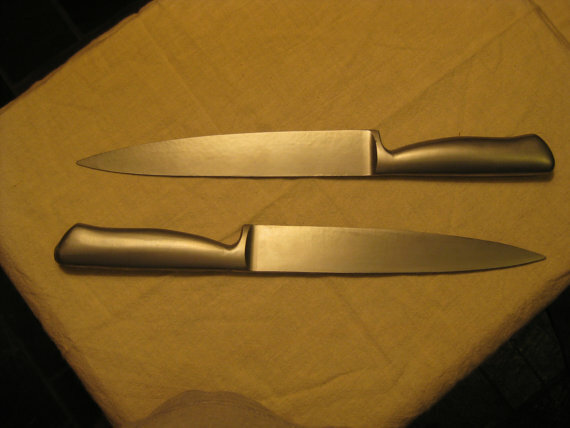 Prop Plastic Safety Butcher Knife. Art by The Shoggoth Assembly. All rights reserved. This item on sale at The Shoggoth Assembly Etsy store! 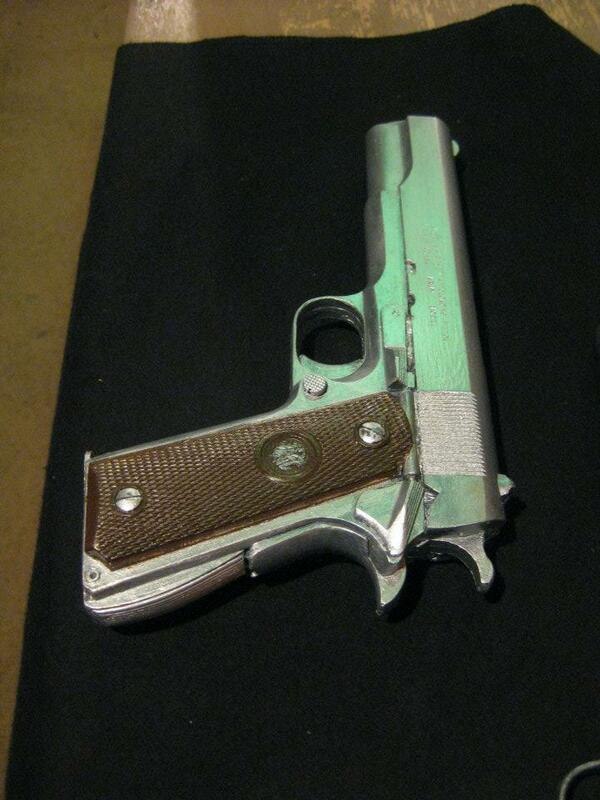 Resin replica 1911 pistol made for Portland Stage's "Trouble is My Business." Art by The Shoggoth Assembly. All rights reserved. The Shoggoth Assembly got its odd moniker from horror writer H.P. Lovecraft. The Shoggoth is an evil entity in one of his most famous works, At the Mountains of Madness. Here is an excerpt that describes the Shoggoth. It was a terrible, indescribable thing vaster than any subway train—a shapeless congeries of protoplasmic bubbles, faintly self-luminous, and with myriads of temporary eyes forming and un-forming as pustules of greenish light all over the tunnel-filling front that bore down upon us, crushing the frantic penguins and slithering over the glistening floor that it and its kind had swept so evilly free of all litter. Backdrop prop from set of the movie 'Adelle.' Art by The Shoggoth Assembly. All rights reserved. 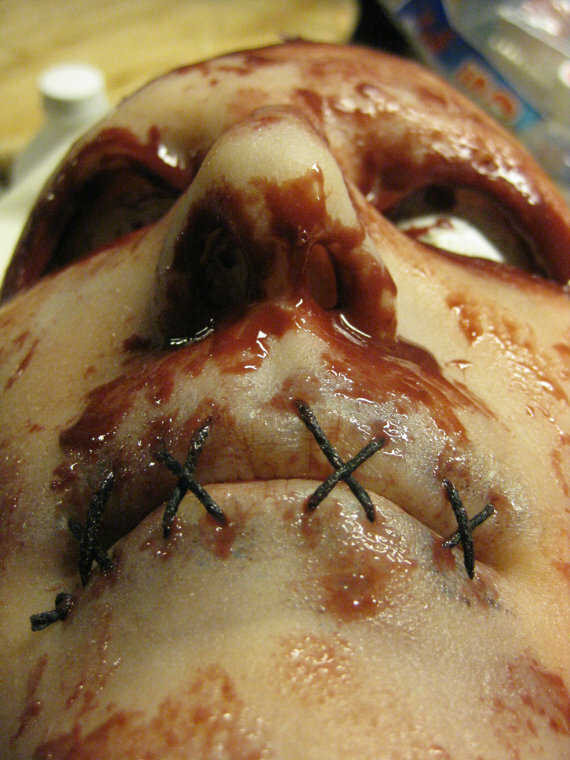 Face Mask - Sewn Mouth option. Art by The Shoggoth Assembly. All rights reserved. This item on sale at The Shoggoth Assembly Etsy store! 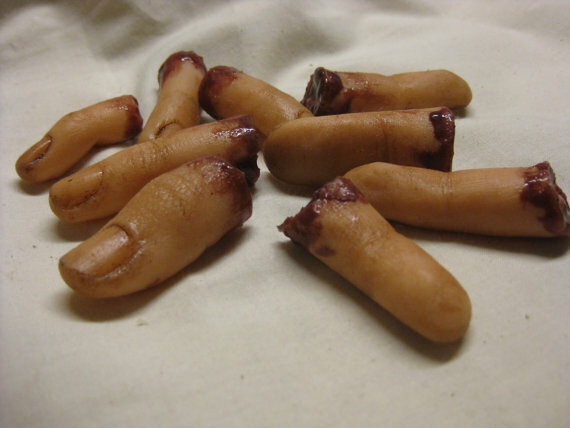 Silicone Severed Fingers. Art by The Shoggoth Assembly. All rights reserved. This item on sale at The Shoggoth Assembly Etsy store! As you can see, The Shoggoth Assembly may be a small Maine company, (the core group is roughly 6 people) but their work is anything but small! With it’s ability to cater to just about any type of SFX project (by having a larger pool of artists with different skill sets) this allows ‘Shog’ to remain flexible, relevant and competitive. This has also allowed the group to quickly add notches to their collective belts since the inception of the company in 2009. Be sure to check out their Etsy page. 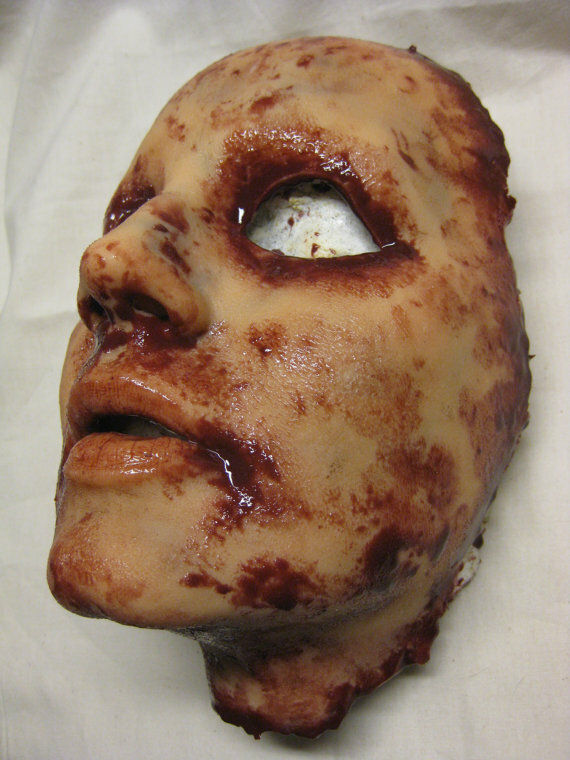 They sell quality, killer, special effects for amazingly low prices! So, Shoggoth Assembly, for your dedication to art, gore and horror Give Us Art! salutes the hell out of you! The Shoggoth Assembly. Special Effects Artists. « Trendsetter Volume 2: The Art of American Great Jacob Lawrence!